Papat Fungtammasan and Tetsuyou Watanabe, Grasp input optimization taking contact position and object information uncertainties into consideration, IEEE Transactions on robotics, Vol.28, No.5, pp.1170-1177 , 2012. doi:10.1109/TRO.2012.2197310　Detail (Please go to get PDF) . While conventional manipulability is analysis in velocity domain and can not include force effect such as gravitational force, the proposing approach can include the force effect to keep grasping. For the purpose, an operation range is introduced. The operation range is for actuator attached with every joint of robot and provides generable joint torque and velocity and their relation (between generating torque/velocity and addable velocity/torque). Using the operation range, we derive manipulability set and measure in velocity domain, including force effect. Detail (Please go to get PDF) . Detail2 (Please go to get PDF) . Tetsuyou Watanabe, Manipulability Measures taking Necessary Joint Torques for Grasping into consideration, Proceedings of the IEEE/RSJ International Conference on Intelligent Robots and Systems (IROS), pp.598-603, 2010. 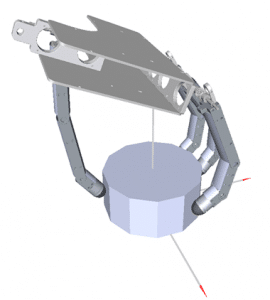 Tetsuyou Watnabe, Joint Torque-velocity Pair Based Manipulability for Grasping System, Proceedings of the IEEE/RSJ International Conference on Intelligent Robots and Systems (IROS), pp.2264-2270, 2008. Passive direction: the external wrench in the directions can be balanced without changing joint torques: balancing contact force can be automatically generated. Active direction: in which we can do a work by moving the grasped object. Based on the above definitions, we show the orthogonality between them and proposed control schema for hybrid closure systems. Proceedings of the 2005 IEEE International Conference on Robotics & Automation, pp.1025-1032, 2005. Proceedings of the 2004 IEEE International Conference on Robotics & Automation, pp.1252-1257, 2004. Here we present a method to plan grasp motion by 2 arms with multi-fingered hands. we propose a task priority based scheme to plan grasping area consistent with whole steps of the given task procedure. Based on the grasping area and the concept of preshape, we derive desired fingertip positions and hand base position and orientation for preshape. Based on the vector field approach, we propose a motion planning method for the planned grasp by multi-fingered hands to avoid any undesired collisions. This method can be applied to regrasping and a motion in which collision is required. 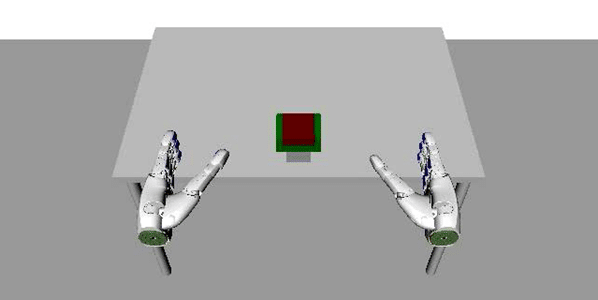 Tetsuyou Watanabe and Michael Beetz, Grasp Motion Planning for box opening task by multi-fingered hands and arms, Proceedings of the IEEE International Symposium on Computational Intelligence in Robotics and Automation (CIRA2009) , pp.1-7, 2009.